In the gorgeous Hacienda Montecristo, you can stay in a beautiful ground floor apartment, next to the pool. The Montecristo is a small select complex in the Country Club estate, next to the beach, in the north of the island. Roof terrace with BBQ and stunning views of the Caribbean, sunsets and the island, across the road from Nicklaus-designed golf course, all amenities, WiFi. We have a local rental manager to to help you to plan and personalize your stay. Our return guests all enjoy a 5% discount on their stay. Humane Society pet escorts enjoy a 5% discount on their stay. Cleaning and laundry, please inquire at the time of booking. Custom-designed tile bathroom, with stained glass window. Linens provided. Cleaning is provided before and after rental. Additional cleaning services may be arranged with property manager for a fee. For rentals longer than 7 nights, cleaning is provided free of charge once a week. Gratuities are not included in rental rates. This was a wonderful condo to stay in while vacationing in Cozumel. and even found me a small footstool to climb into the big fluffy bed. We enjoyed the pool and beach, although the snorkeling out front was not as good as when the wind blows the other way. We felt very safe in the gated environment and thought the unit was very clean. Steve was also willing to buy a few groceries for our arrival, which was very appreciated since our ferry arrival was quite late. We would love to go back for a visit sometime. You are welcome any time, Evalyn. We will have the footstool waiting. My wife and I just completed a two month stay at Casa Inglesa. Overall, we could not have been happier with our experience. Steve and Maria are wonderful hosts and are genuinely eager to help in any way. The apartment is absolutely perfect for two people and comes well stocked with virtually everything you need for your stay. In addition, for a smaller apartment, there is loads of storage and closet space which enables all personal belongings to be put away neat and tidy. Each morning we would walk to the 4th floor rooftop veranda for our morning coffee and enjoy the views of the beautiful caribbean sea. The beach is a 30 second stroll from the apartment and is perfect for walks, swims and snorkeling anytime of day. We both recommend Casa Inglesa highly and will be returning soon. Thank you, Rick and Alisa. You were wonderful guests and we can’t wait for you to come back. El gringo Pique and coconut ice cream will be waiting. Scouse is still looking for you. Casa Inglesa is a gem! It’s a great space in a condo unit on the north end of the island. Steps to the beach for miles of walking and snorkeling. We purchased bikes and rode them for trips to further beaches, restaurants and the grocery store. A taxi pick up is right next store at the Melia. 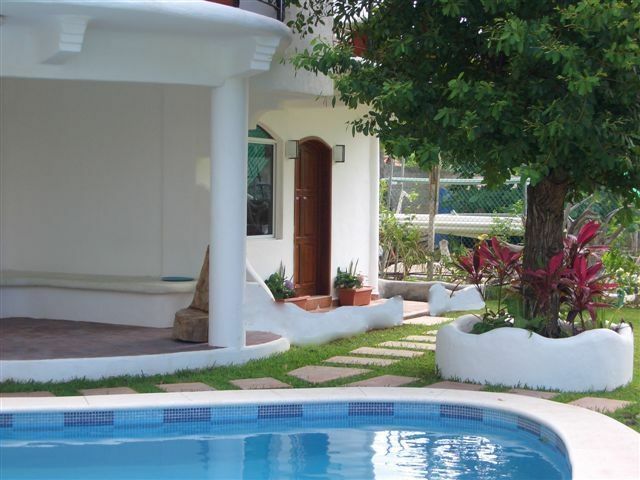 The condominium common areas, pool, garden and roof top deck are lovely and well maintained. Steve and Maria are gracious, responsive and accommodating hosts. They took us to the grocery store and even to their favorite taqueria! They have many suggestions for fun on the island. Their love for Cozumel was evident in the way they welcomed us. Book your stay here, you won’t be disappointed! Thank you. It was so nice to see how much you enjoyed being here and making the most of our wonderful island. You were perfect guests. We will be here with Yoko waiting for your next arrival! Very clean and well kept! Maria is phoenominal to work with. She truly cares about her property and about the people who stay there. We normally stay at all-inclusives and wanted to try something different. We were not disappointed. Maria does such a wonderful job of giving you information you'd never know. The restaurants she advises were exactly as described. The beaches were the same. We also recommend renting a car as we did. It was awesome having the freedom to travel the entire island and not be on a schedule or have to wait for a taxi. If you're looking for a relaxing vacation this is it! You're far enough away to enjoy peace and quiet but close enough to be a tourist. On a personal note, I lost my diamond wedding band on our trip and was sure it was lost at the airport security. Maria reached out and asked if I'd lost it. I'm a grown man and really don't remember the last time I cried until today when she contacted me. Maria is TRULY a blessing and God has a special place for her. back for the third time! Casa Inglesa is a well equipped, clean, well maintained one bedroom apartment in what I would consider to be one of the prime locations on Cozumel. The overall complex, Hacienda Montecristo is gorgeous and well situated near the beach, good snorkeling, the island's only golf course, several beach clubs (Buccanos, Playa Azul and Coral Princess all come to mind) and lovely walking and biking paths. This year was the third extended stay in this unit for my wife and I and we plan on returning again in 2018. The owner, Maria, and property manager, Paco, are both wonderful and make things go as smoothly as possible at all times. We love this place and would certainly not be returning year after year if we felt otherwise. Thank you Maria. You are perfect guests and I'm so glad you enjoy your stays in Cozumel so much. We so enjoyed our stay at Casa Ingelsia. It was one of the best places I have stayed at on Cozumel. Divers paradise on Cozumel island, Mexican Caribbean, not far from Cancun. Relax, snorkel, dive or take a romantic walk on the beautiful beaches and watch the sunset, or watch the dolphins swimming past. Enjoy a game of golf, or go horseriding. Mingle with the friendliest people you could wish to meet, and enjoy the family fiestas on Sunday evenings. The Casa Inglesa has all this and more to offer. Feel the sand between your toes and relax in your own home from home in the sun!